This pack just got even more dynamic. Not only can you use the Lowepro Flipside Trek BP 350 AW for your standard DSLR and attachments, but now you can use it for your DJI Mavic Pro Drone. It's a large travel camera backpack that offers a secure, safe pack for every photographer's outdoor adventures; it holds all the essentials. You can fit a standard DSLR camera plus lenses, a compact tripod, off road gear and accessories. The CradleFit technology is specifically designed to hold a tablet up to 10". There is room for personal items in the top pocket, or utilize side mesh pockets for those grab-and-go items that you need quick access to. 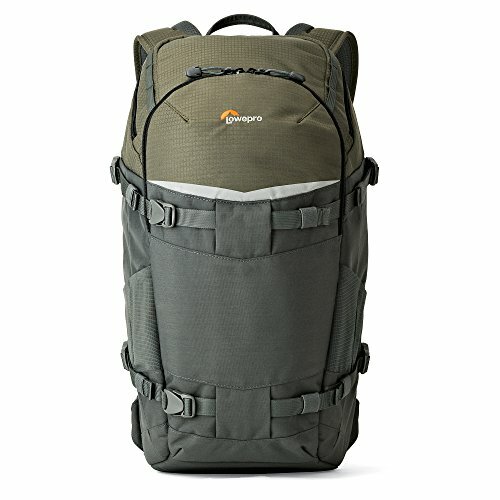 The Lowepro Flipside Trek BP 350 AW's large exterior dimensions weigh in at 11 x 7.9 x 20.1 inches, while interior are 9.1 x 5.5 x 11.4 inches, and it has a 15L capacity. The large size allows you to carry everything you need, without being overwhelmed by size and weight. Let your pack work with you as you utilize the easy to access gear attachment points both inside and out. You can size up or down based on your equipment needs, on a case-by-case basis. Available in Grey/Dark Green, this is the ultimate travel pack for photographers who like to get outdoors. The comfortable ActivZone suspension and padded shoulder straps make it wearable from sun up, to sun down. The suspension system offers both chest and waste straps to keep weight evenly distributed and balanced on your body. Made of Poly 500D Kodra, Poly 500D X 300D Dobby, Tricot Polyester, and Velex Nylon, you know that it is durable, tough, and will last for years of use. Your valuable gear will stay protected with CradleFit technology for your 10" tablet, and a built-in All Weather AW Cover to protect against snow, dust, rain, or sand. NEVER PUT IT DOWN. The Flipside Trek's patented access allows you to get your equipment without putting your pack down. It offers split camera and open space compartments, so you can take both personal and professional gear. Take your photography and drone piloting to new heights!